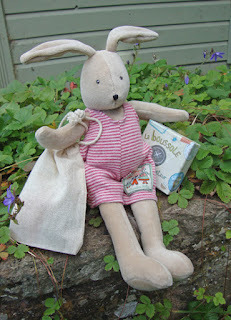 Cottontails Baby: The Cottontails Travelling Rabbit - would YOU like to host him? The Cottontails Travelling Rabbit - would YOU like to host him? 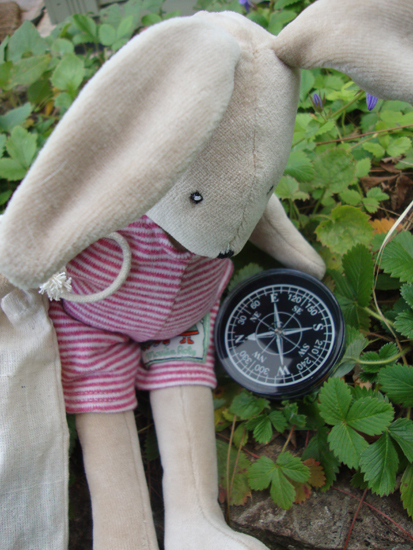 He has packed a little bag, acquired a compass, and is all ready to head off on his travels. But it's a bit world out there for a little rabbit, and I think he needs some safe places to stay during his adventures. Would you like to play host to Sylvain rabbit? He would arrive at your house (with bag and compass) and stay with you for a few days. Perhaps he could help out in the garden, or do a spot of work around the house? And he would love to be taken out to see the local sights. He is fully litter trained and very well behaved. Usually. Please leave a comment on this post, or email me charlotte@cottontailsbaby.co.uk if you would like to play host to Sylvain. This is something completely new so I have no idea if there will be much or any interest. But paws crossed. He is very keen to get out there and have some adventures! "I think I shall head East..."
oh this could be fun! Do you think Sylvain would enjoy a trip along the Water of Leith? Does he have a passport? I think he would love the new gardens at Seattle's Space Needle! I'd welcome Bunny to this part of Yorkshire for lots of woodland walking and some gardening......lots of carrots to dig up! If Sylvain does indeed get a passport we would love to accommodate thins intrepid traveller for a farm stay in Ballarat, Australia. Chuffed with all the offers - thanks ever so much! He will happily come to you all over the next few weeks... He is off to his first destination today, I will post regular updates and email you for addresses etc when he due with you. Hooray! If Sylvain hops down to stay at the farm in Ballarat, Australia, we would love to host him for a stay in our Melbourne toy store, Honeybee Toys (honeybeetoys.com.au), where he can visit with his Sylvain Aussie cousins and have fun playing with the toys here. If Sylvain hops downunder to stay at the farm in Ballarat, Australia, then we would love to host him at our Melbourne toy store - Honeybee Toys. He could have lots of fun meeting his Sylvain Aussie cousins and playing with all the toys here!! Hi Melissa - if you read this comment reply (am never quite sure how these things work!) 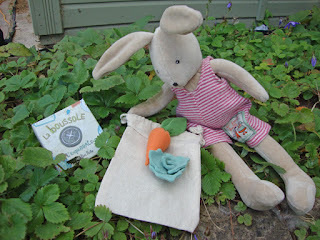 could you please email me enquiries@cottontailsbaby.co.uk about having Sylvain to stay? We would still love to have Sylvain come stay with us. We are moving house though is 3 weeks. So if he is still happy to come that would be great. (I can give you an alternative address to make sure he arrives safely).